I can't take credit. Freak2demon mentioned the k-sports. I didn't look too closely at his pm of what the k-sport design but was interested in reducing weight, and doing away with the mechanical cable without losing the e-brake and parking brake capabilities. Freak2demon had also had showed me what he was thinking of for calipers and rotors. However, I didn't like the caliper and rotor selection for what I wanted and I found the above Dyanpro Narrows. After I found those calipers I started digging into the hyrdaulic e-brake and came back to what he had already mentioned. I still have to check the fitment of the k-sport e-brake in the stock position and verify it is truly inline. 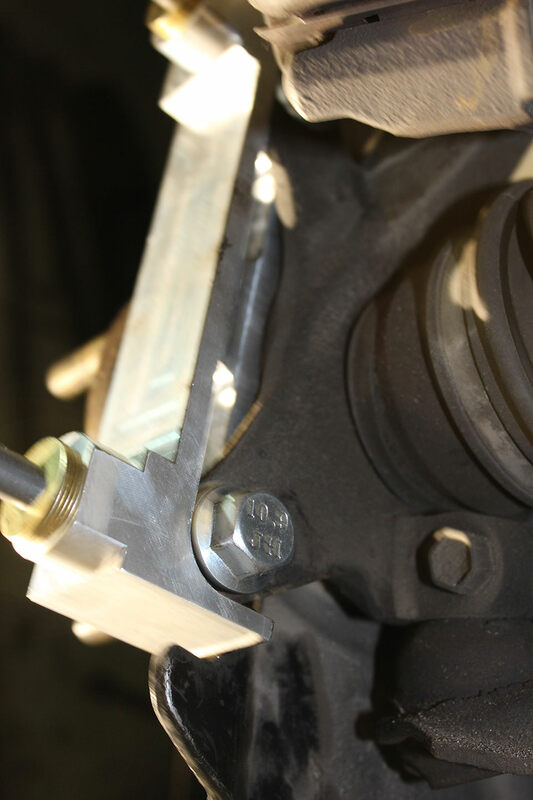 The Dynapro calipers are almost three pounds lighter being all aluminum instead of mixed steel and aluminum of the combination parking brake caliper. The price for the calipers is almost the same, but there is the $270 plus the lines fitting and other materials plus time. I'm thinking flange the stock lines mid way back and run a short flex jumper over and back to the centeral e brake, and then use the stock solid line back and use my aftermarket BF Goodridge flex lines to the calipers. I would like the stock parking brake cover to fit over, but I won't know until I buy them. Like everything when your trying to make something work you can miss a small detail. The Narrow Dynapro Radial Mount calipers 120-14091 (-BK if you wanted it black powder coated) show that they can take an 11" rotor in the schematics page, but then the outer page lists the minimum rotor size as 11.75". 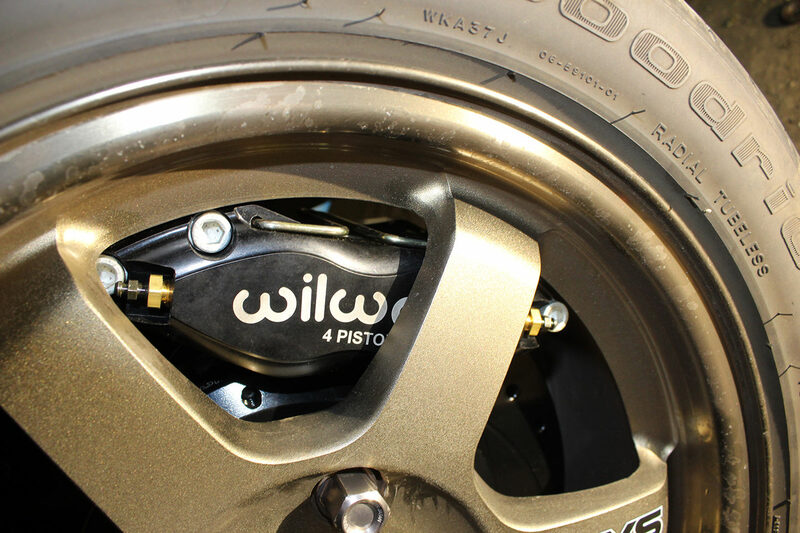 One more thing to call Wilwood about. 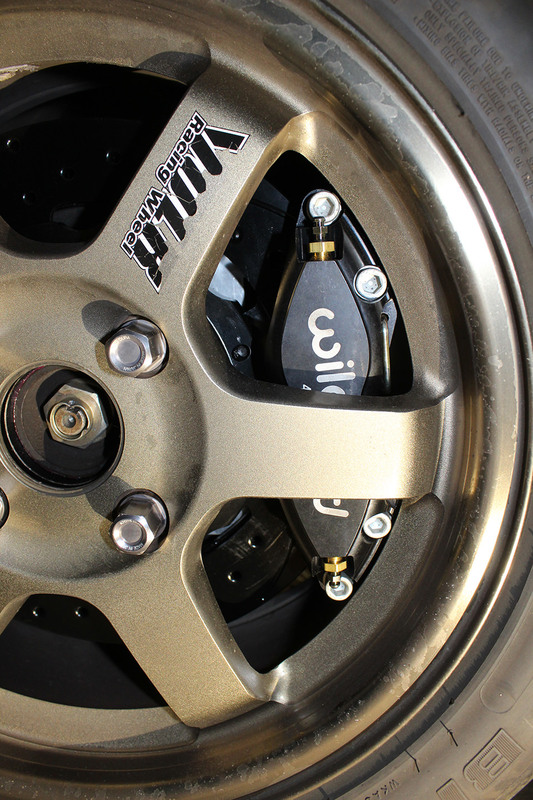 I did see an alternate for the calipers which is the Dynapro Lug Mount Low Profile calipers 120-12160. This will reduce the brake pad size which in my opinion is good for the rear caliper to 5.1 square inches and reduce the weight by .4 more pounds from the Narrow caliper above. It is a 5.25" lug mount which may simplify the bracket design further shaving weight and it is significantly cheaper especially if you don't want it powder coated. I'll check the dimension for the rear today and compare both caliper offsets to make sure they will work. Unfortunately the Dynapro Lug Mount Low Profile caliper will not fit on the rear. Going from the 0.39" stock rotor to a 0.81 will cause interference issues that simply won't work no matter which way I adjust it. However, the Narrow Radial Mount Dynapro calipers appear to be able to fit. I will have to redesign the bracket, but it should fit. I did run into a slight snag with the hat beyond what I mentioned above about the inside hub diameter. The offset of the hat I want to go with is 0.77" compared to the stock hat offset of 0.646", and I'm increasing in rotor width from 0.39" to 0.81". These two things will bring the clearance between the backside of the rotor and the hub mount to 0.183". This is not enough room to get a bolt head in between. I thought about studs, but I need to be able to turn the bolt. I did find ARP 3/8-24 x 1.25" UHL (723-1250) low clearance bolts that reduce the head height from .39" to .30". I need a minimum of 0.38" between to be within the 0.08 tolerance. My solution is to lathe the thickness of the hat 0.30" from the bottom end. This should allow me to get a lock washer under the head. It should also give me enough outside edge clearance still. 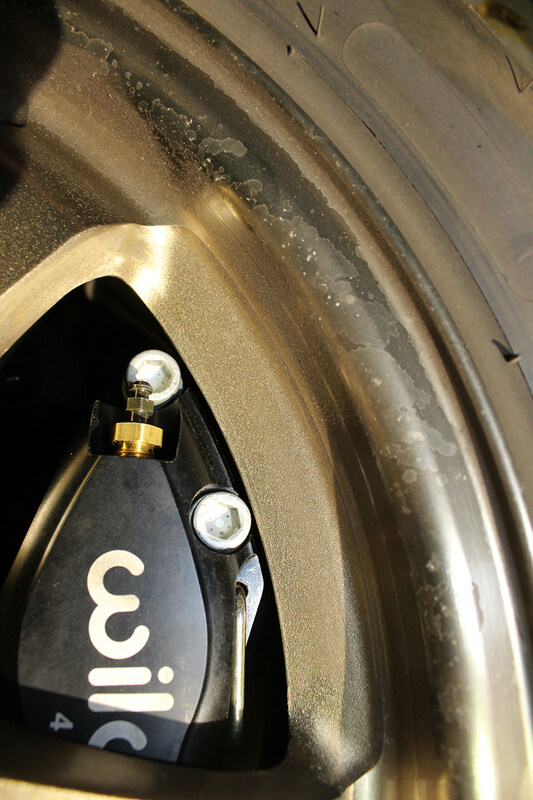 The 1.92" outward bound distance from edge of rotor on front calipers clear with 0.39" (10mm) wheel spacers. The back I'm running only 5 mm spacers, but the outward bound distance is only 1.67". The difference between the two is 0.25". That would leave a 0.5" negative clearance difference. However there is a offset difference between 0.77" and 0.73" (difference of 0.04"), plus the face difference between 0.32" and 0.25" (difference of 0.07") which totals to 0.11" - the 0.5" = positive 0.06". Effectively the offset of the hat will go to .047", yet the with the 0.32 face the hat will still be 0.79" thick for the six bolts to mount the rotor to. 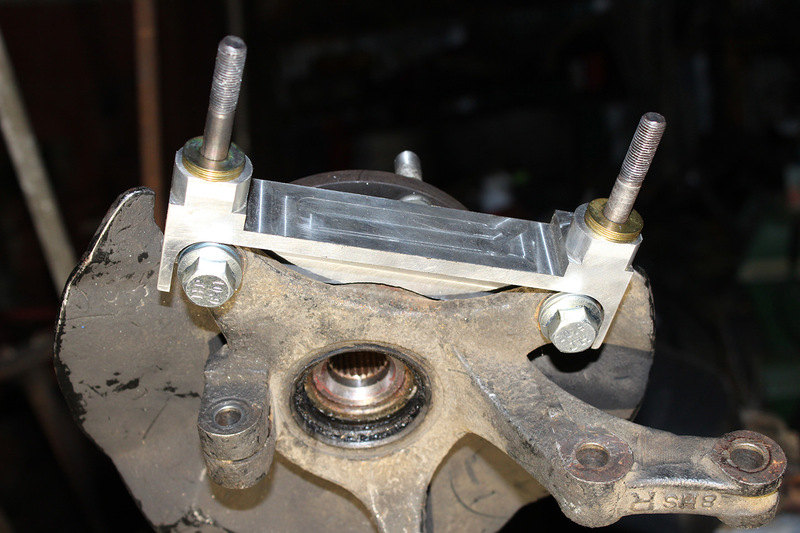 The bracket will be on the other side of the stock hub mount. A little bit of an update. 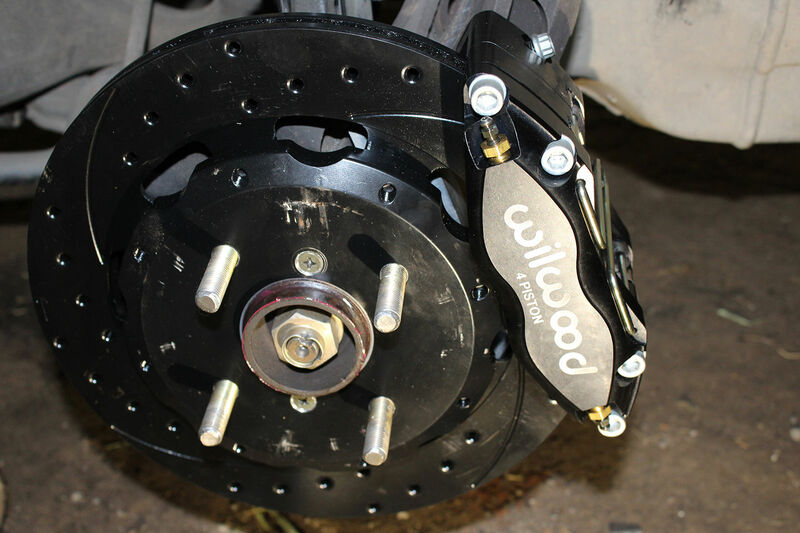 Wilwood Brakes said they don't recommend the Dynapro Narrow Radial Mount calipers on a 11" rotors. They said possibly a brake pad overlap issue and not an interference issue. Not a lot of information from them when I mentioned that the Dynapro Radial Mount calipers use the same brake pad configuration. The tech guy said ultimately if you can make them work great. He did recommend the Dynapro Radial Mount with one of their proportioning valves. I don't really want to go that way. Additionally, I'm not thrilled about trying the Narrows and then having to send them back. I did see a photo posted from Teamswift where the whole mount was designed and not just the bracket. Today I will see what is possible there and go back to looking at the Dynapro Low Profile Lug Mounts which are a heck of a deal for the price. There were some issues with this first set of brackets. Part of the problem was the quick conversion from metric to standard. It did throw some of the measurements off. I ran into two clearance issues: one was the center of the hub, and the other was the bottom relief is not quite deep enough. The first clearance issue was solved by a couple quick passes on grind wheel, the second one however is not as easy. I need an additional 5/64" removed from the bottom of the inset. I thought I had accounted for this additional tolerance, but who knows at this point. I also have to shim the top studs more than I want to. I have already entered the new measurements into the program to solve any issue that came up. Additionally, I am also going to lighten the bracket in the center. For now I will make these ones work until I can get the next ones cut. Notes on cut: Before I forget I wanted to document the conversion to CAM and Gcode process. The top cut you will need to extend out to get a square cut beyond the edge of the bracket. I have already converted to standard, but anyone having these made will want to ask ahead of time for what the machinist wants. Very helpful to give your machinist a 3D drawing print out with all the measurements on it. Make sure you write down the drill bit size for tapping to 3/8-16 and 12x1.25. It is also helpful to have all your start corners be the same corner. 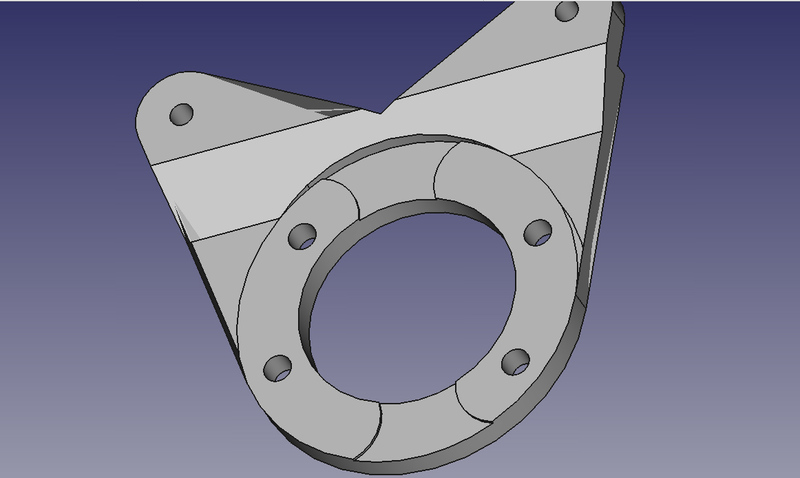 To make the bracket you will only need the front and the top dxf files. 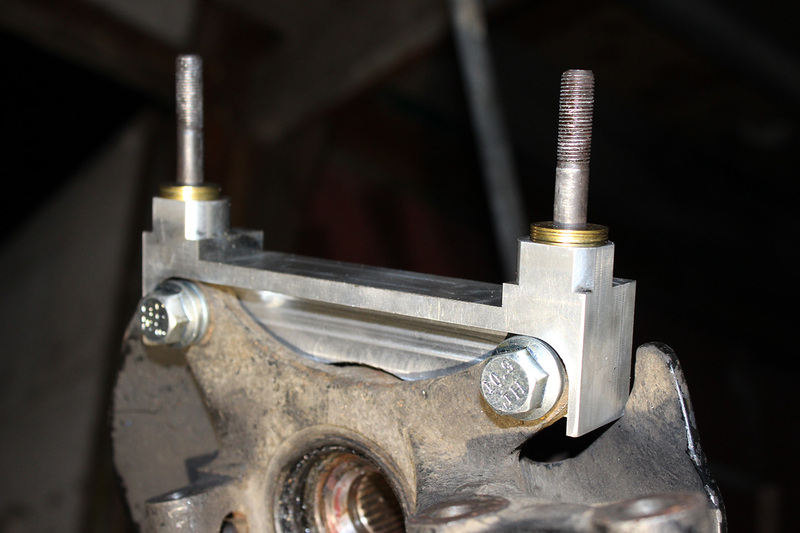 The front brackets went back to machinist to fix clearance issue. I took apart the rear brake mount and made some detailed drawings which was easy since I could lay the part down on graph paper and trace it. This part should be easy to make sense I can pick up 6 mm just by having a straight bracket. There is plenty of clearance to work in both directions. If I start with one inch thick stock of aluminum the clearance I need should be easy to get, and I get to make the bracket smaller (shorter). I will have to eventually sand and clear the wheels. The good news is I can shim this one millimeter in. This will add to my clearance overall which is right at the limit of .08. I could not find a good source for a 12 mm shim washer. I'm thinking I will take my 3/8 washer and drill the inside out to 12 mm. What the pictures don't show too well is that it is only the very outer edge where the clearance is tight. Everything is free rotating with absolutely no rubbing. I'll take another look after shimming the bracket 1 mm. I could also put a 1 mm shim spacer on top of the wheel spacer to bring the wheel out 1 mm. I wasn't really trying to show the calipers off in this fashion, but I could not have put them out there literally any closer. I did not actually hook up the brake lines since I still need to get the data for the stopping distance on the stock setup. Side note the Dynapro design is freaking awesome as far as brake pad install. 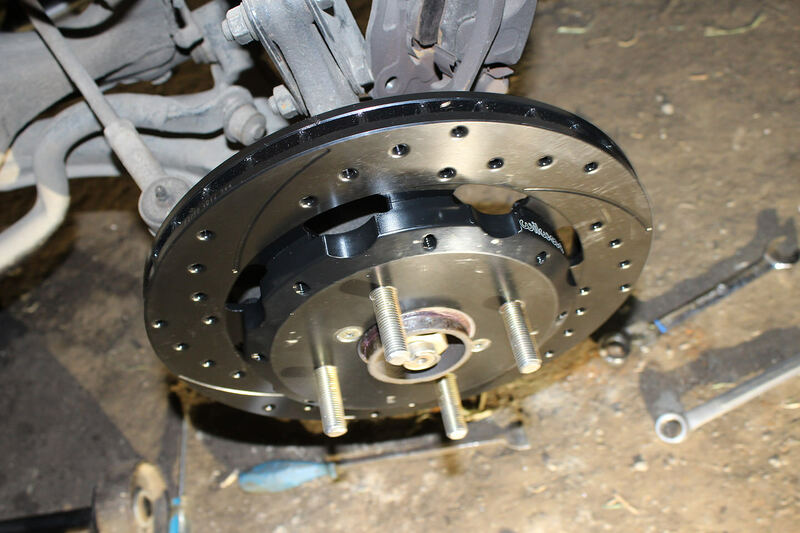 No more fighting to get out and in a brake pad. There is also nine different coefficient grades of pads for these calipers. I have on the street grade BP-10 Smart Pad. I have the rear brake mount design underway also to fit the Dynapro Low Profile Lug mount calipers which was the better caliper for what I wanted and supports a 11" rotor. 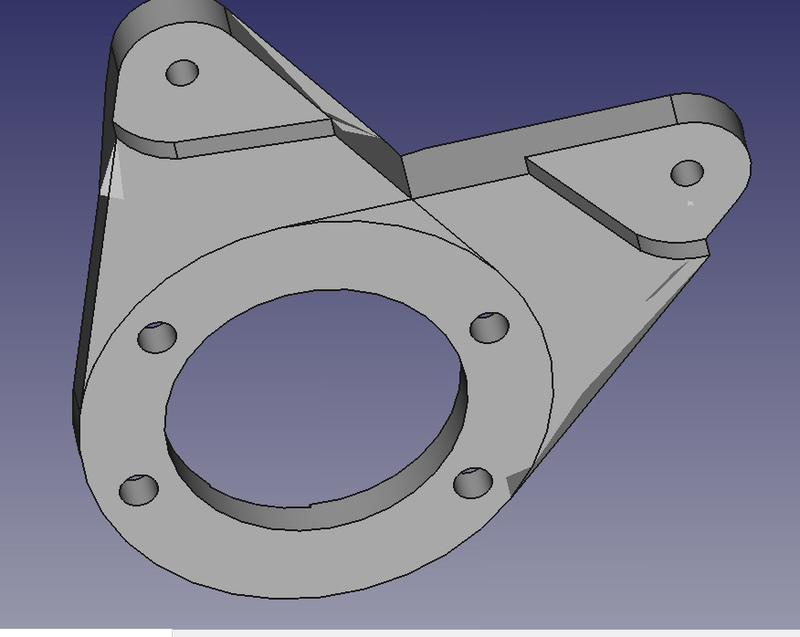 I am having to learn a little bit more about Freecad to sketch and extrude a sketch. Despite what I said above the rear mount will be slightly longer, but a wider spread. However, it will be lighter by probably a pound or two since it will be aluminum. 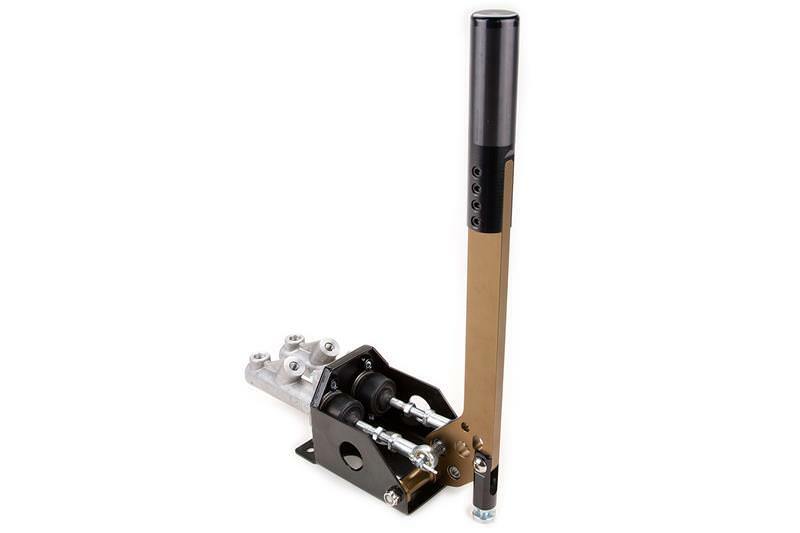 I called K-sport today for their dual piston hydraulic hand brake. It is indeed inline which means that it will work with our front left, rear right and front right, rear left setup. However, the unit is quite expensive and on top of that the line installation kit is over $100 for each side. Additionally, it can not be used horizontally, and there is no emergency brake lock. Parking would rely on leaving it in gear. I don't believe there is room to leave both parking brake and hydraulic brake. 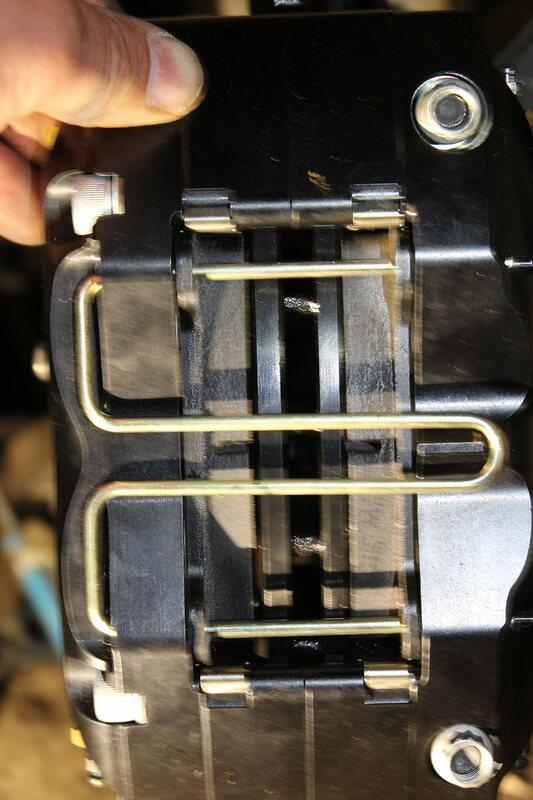 The good is that the unit does not use separate reservoir, and the piston are 3/4 which will mean that they can lock the rears with more clamping force than the stock master cylinder even if the stock emergency brake was hydraulic. I did also get the in and out threads for unit. In is 7/16-20 UNF, and out is 3/8-24 UNC. What I will try to find is the right fitting to slip on hard steel lines. There is no advantage and no need to having a flex line where I want to connect it. This should save me at least $100. Front setup is installed and working with no clearance issues. 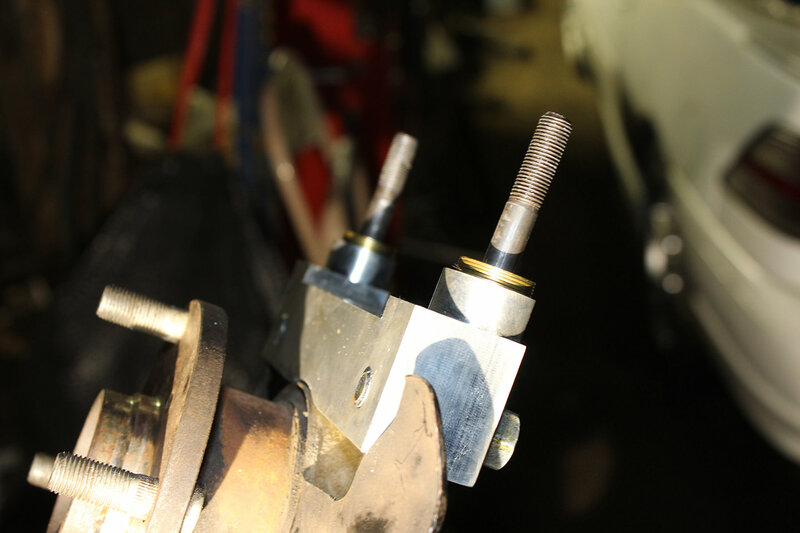 I did grind down the two center bolts on the outside edge to give me a .08 clearance. 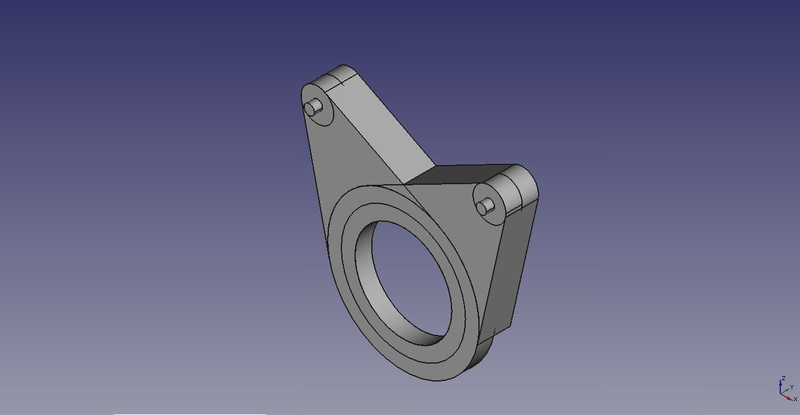 I'm attaching more updated files for the rear mounts. good looking brackets both front and rear. Id seriously consider loosing the washer spacers to give more wheel clearance. rule of thumb you want to finger width of clearance. With unknown second hand wheels they may flex enough to clash. Plus where does the wheel balance go if needed on the outside of the rim? I will be able to pick up 1mm more of space from a bracket correction. The weight will have to go in a tiny bit instead of sitting on the edge. I don't think it will effect the balance. Wilwood is the one that listed the .08 as the minimum clearance. I have no interference issues with the strongest side force I could probably put on the wheel. For those who want more clearance all they have to do is turn the bracket around and mount it from the other side. They would then go with 1.22 offset hat and simply use a spacer to bring it into alignment. I can always increase the size of wheel spacer by a couple millimeters. How those wheel are built it is only the 1mm edge that is close. The backside of the caliper is over 1/2" clearance. 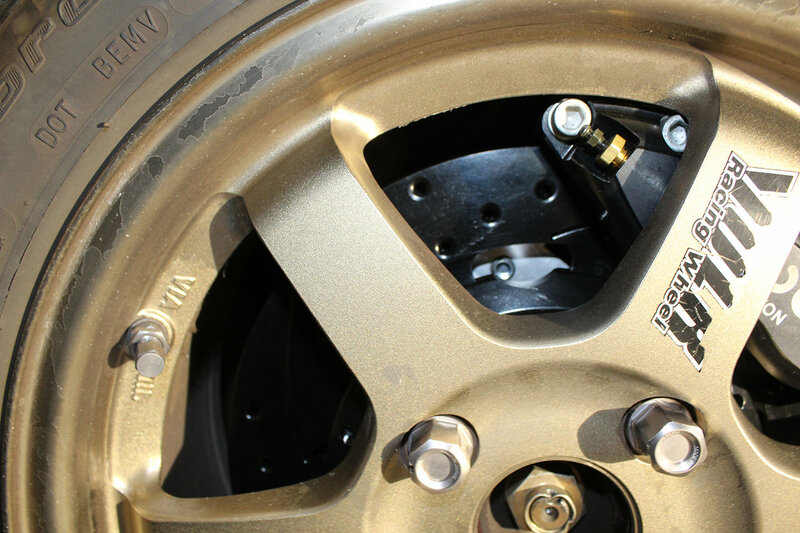 The wheels are also hub centered which will minimize any wobble. Thanks. The rears setup is not too far off. Rear mounts files and my updated front ones are with my machinist. I will order one 11" disc and one caliper in so I'm ready to test fit when the mount is done. 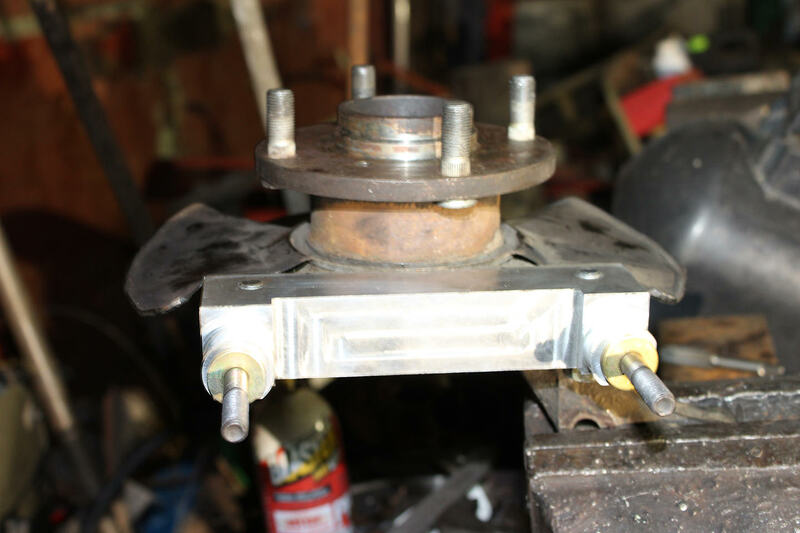 I revised the mount holes so the rear caliper will be facing forward, and it will allow me to mount a spot caliper on top which will best match the pathway of the stock emergency brake cable. It will be a bit before I finish everything else off. I will still need to design the spot caliper bracket which should be easier sense it is only mounting to the two top holes. Later on I will purchase the dual cylinder hand brake. 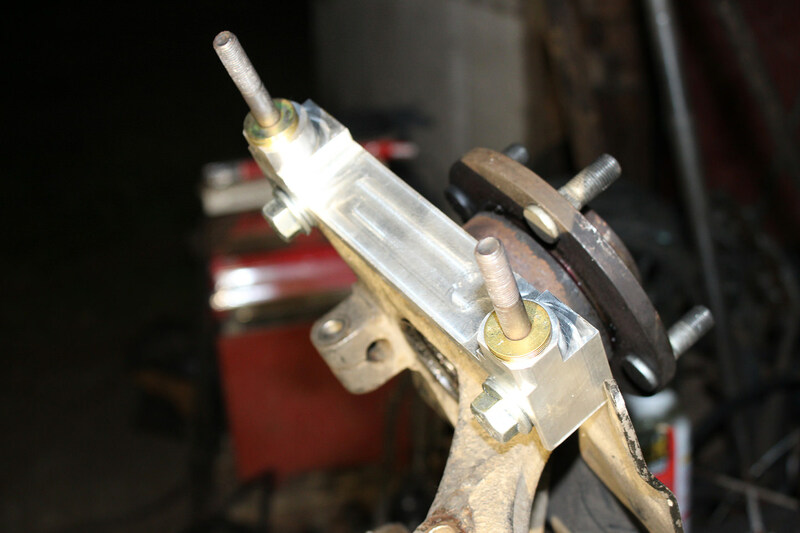 I will have to build a mount plate to accomodate both the stock hand brake and the hydraulic handbrake. I'm waiting on the rear mount. 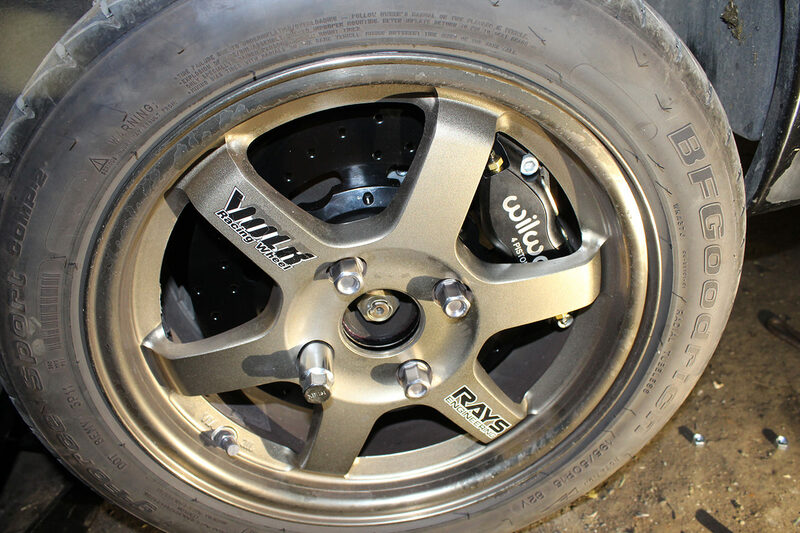 I did get one of the 11" rear disc and one rear Dynapro Lug Mount Low Profile Caliper. 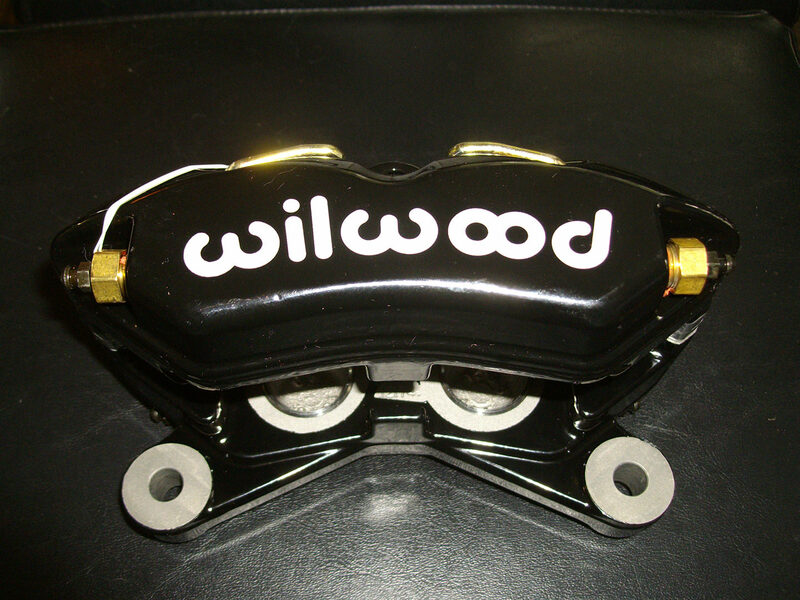 Below is the rear Wilwood caliper I am using. 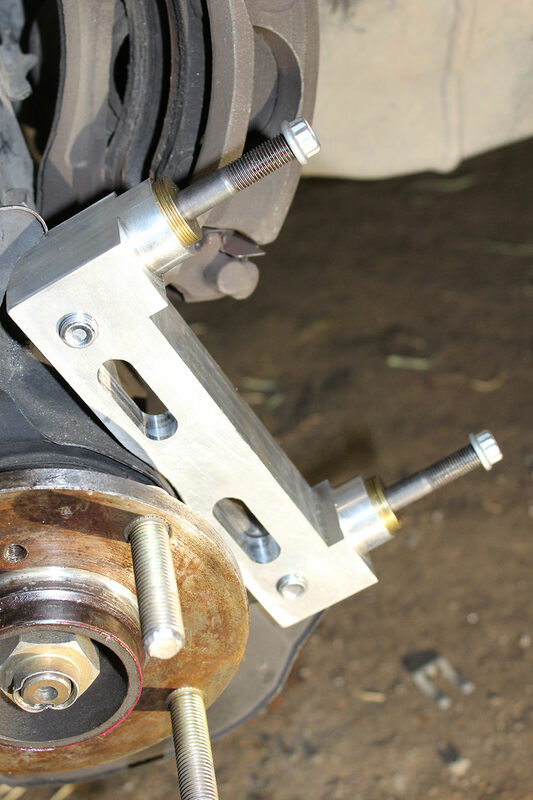 This will mount on the front quadrant and the spot caliper will be in the stock position above. I still haven't made the bracket for the spot caliper. 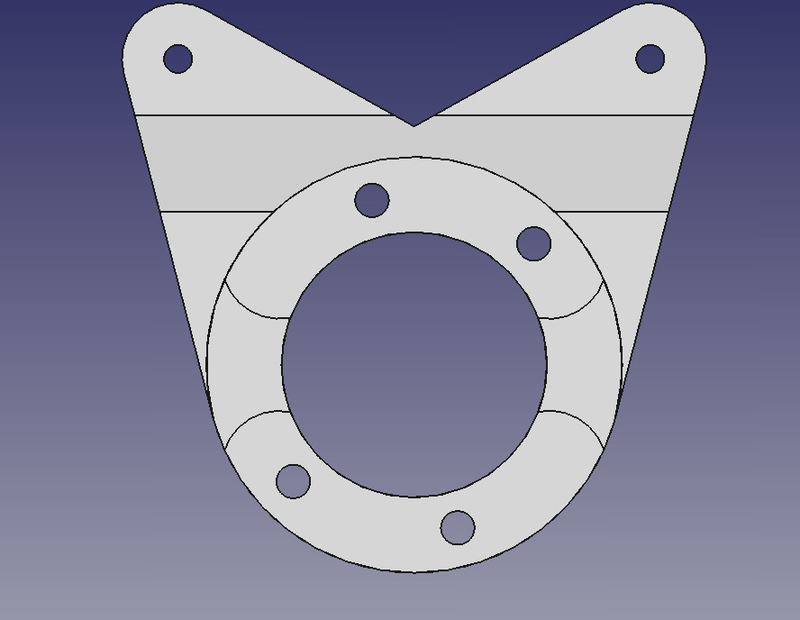 I did write a complete brake thread on this whole project and will post it up here with dxf files and math at data to go along. A little update, the Wilwood 171-8975 6x6.25 hats fit our rear and front hub spindles. 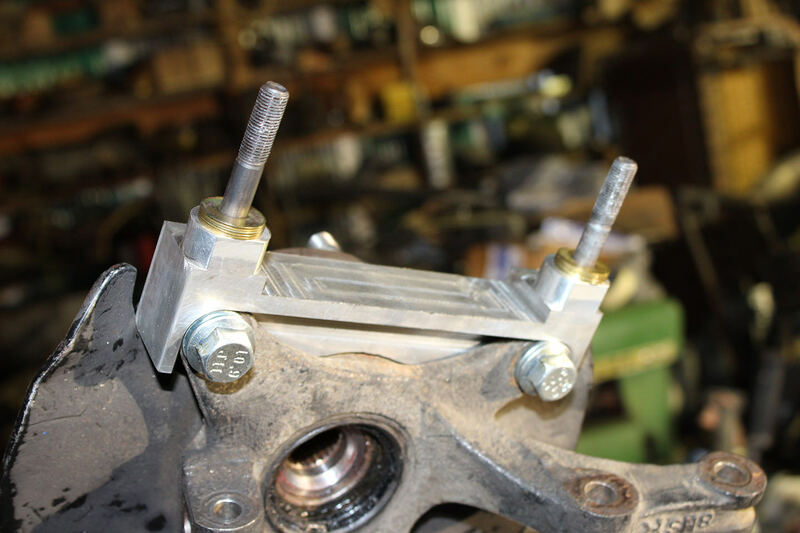 These come as blanks, and need to have the center bore drilled out to 64 mm, the stud holes drilled to a little over .5, and the fastening holes drilled. Wilwood has these listed as having an inside diameter of 5.10". Our 5.25" spindles will fit without lathing out anything to the inside diameter. I had posted above, but never answered this question definitively. It is unfortunate they they have these hat listed without a more accurate listing of the specifications. The hats are quite light when they are all drilled out at 1.4 lbs a piece. 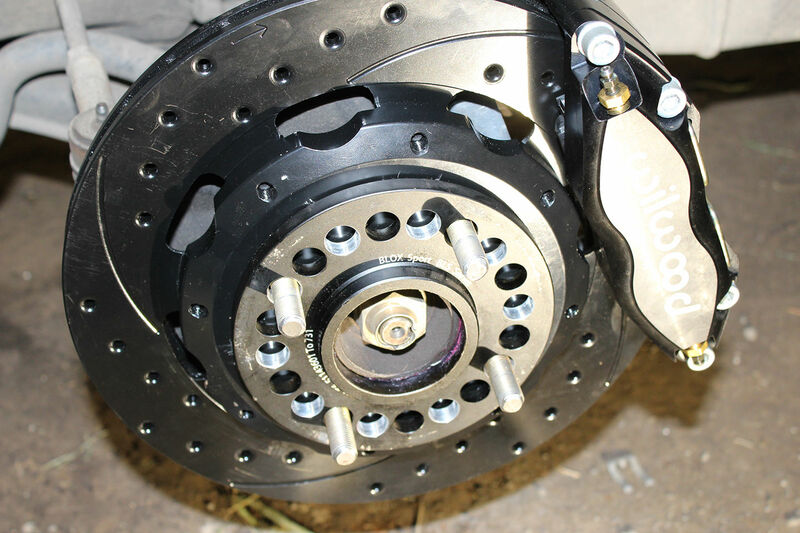 What is the weight of the front disc assembly with the callipers and spacers added? Just trying to compare apples with apples. The same for the rear assembly but I suspect there will be a real difference there with the deletion of hand brake cables and handbrake actuator. I will have to get back to you on the total stock weight. 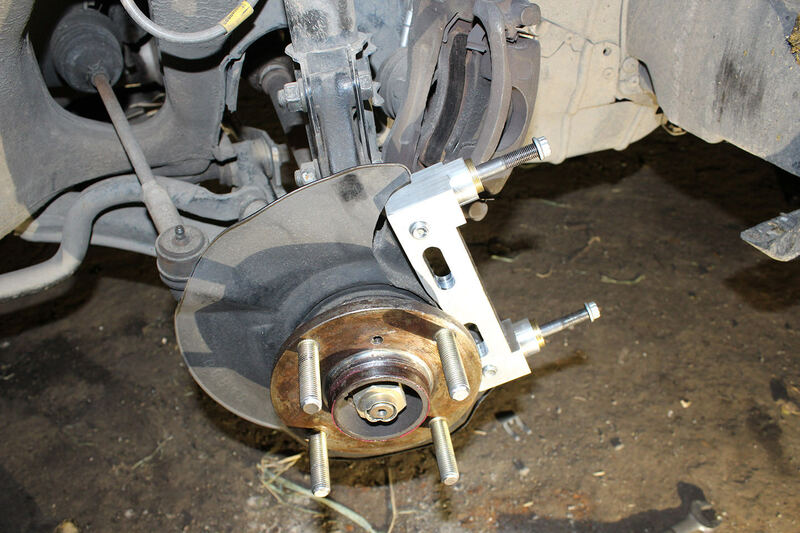 Brake caliper without pads stock front for GT (includes bracket + bolts): ? I will have to weigh these but I am guessing 6 to 8 lbs. Weight savings 1.4lbs to 3.4 lbs. Remember though this is for an increase from 250 mm rotors to 298 mm rotors. 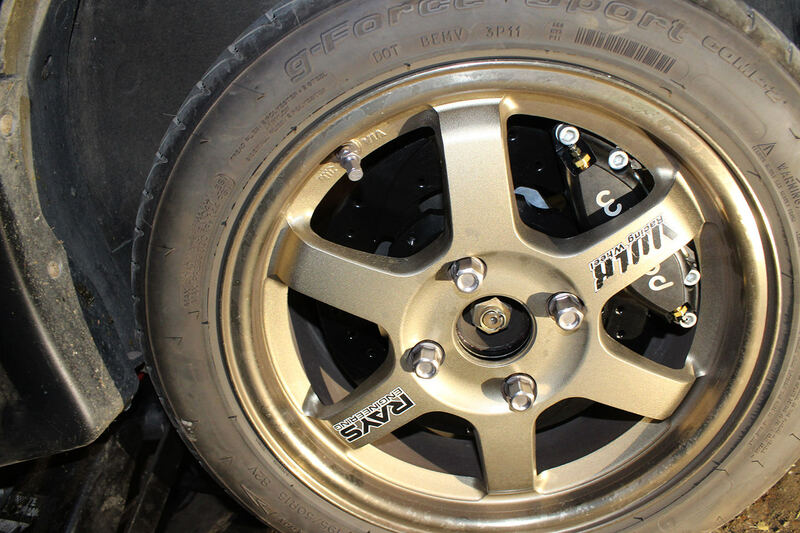 The 11" SRP rotors are 7.7lbs + .3lbs for bolts (6 vs 8 bolts). 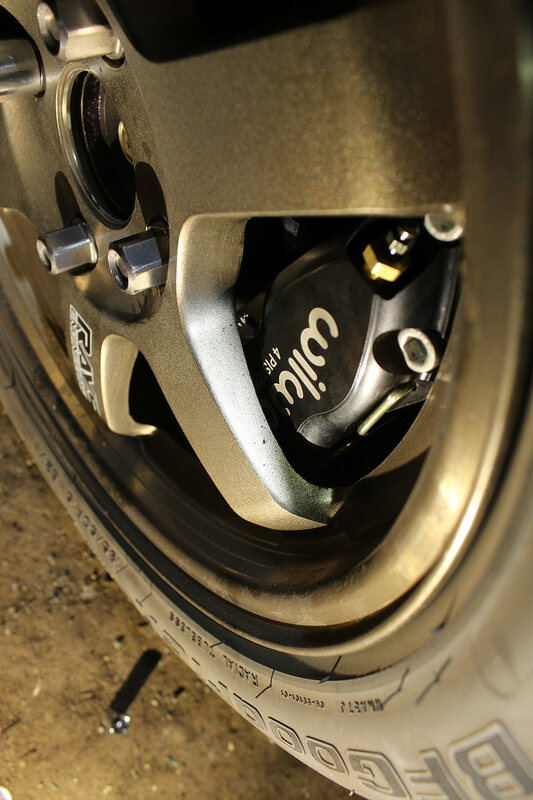 The rear calipers Forged Dynapro lug mount low profile calipers post above are only 3.6lbs. I am using these for street daily driving and will retain my emergency brake with mech spot calipers which are 1.7lbs with pads. The total weight for the calipers in the rear 5.3lbs, which is still quite a bit lighter than the stock rear setup. Still waiting on the brake parts, and sense all I have time for is work I can wait. However, I am starting to purchase parts for the turbo system and am looking at a few different contenders. Remember this car is my daily driver, and I'm not looking to go over 200 whp. One of the contenders is a Turbonetics T3 50 ball bearing unit. I have ran the top end cfm numbers on the compressor chart at 216 cfm. I ran the numbers again at 8500 which is where I imagine I don't want to run past all that often irregardless of how well I have the engine rebuilt. I did bump the volumetric efficiency for what I think a different cam grind would provide. (79.3 x 8500 x 0.5 x 1.11 % / 1728 = 216 cfm ) this would be the high side of what I would run a compressor map for matching a turbo. 216 cfm is just under 18 lbs per minute. The fit on the compressor map is quite nice. Anyone know if this unit comes water-cooled? I'll try calling them tomorrow. Anyone have some feedback between running a .48 or .63 turbine housing? Anyone have a recommendation for another turbo? I do have a IHI RBH5 vj11 Mazda/Ford turbo on hand, but I don't really want to run it.